Restylane® and Perlane® Cosmetic treatments are an innovative approach to reducing and even eliminating facial wrinkles. Deep laugh lines, nasolabial folds and lines around the mouth and lips can all be treated. The products can restore the youthful volume to the face and fullness of lips. Restylane® and Perlane® are made of hyaluronic acid, the same viscous substance that lubricates our joints! Both products are FDA approved for the treatment of moderate to severe facial wrinkles and folds. This material is not obtained from donors; rather, it is synthesized in pure form in the lab. Because it is a thick substance that occurs naturally in the human body, it is more comfortable, lasts longer, and feels more natural than other injectable fillers such as collagen. Restylane is the most used cosmetic dermal filler, and has been used in more than 1.4 million treatments in the U.S. These injections are performed very comfortably in the office under local anesthesia. At most, only a very slight sting may be felt when injections are made. Injection procedures usually take only 10-20 minutes. Because this is a substance that is also naturally-occurring in the body, results are not permanent. Initial results typically last 6-12 months; however, with repeated injections on regular intervals, the results can become progressive. After the procedure, patients may experience slight bruising around the area that quickly fades. 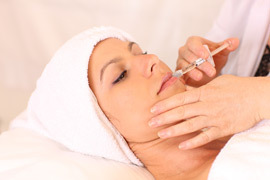 Swelling, redness and tenderness after the injections is minimal and also resolves quickly. Normal activities can be resumed almost immediately. One of the benefits of a reversible injectable filler such as Restylane® and Perlane® is that the effects will dissipate and disappear over months, such that should a patient desire their pre-procedure appearance, they can achieve it once more.